Anti-poverty activists in Halifax, Nova Scotia rail against government authorities for failing to ensure an adequate supply of housing for low-income individuals. Screw that. 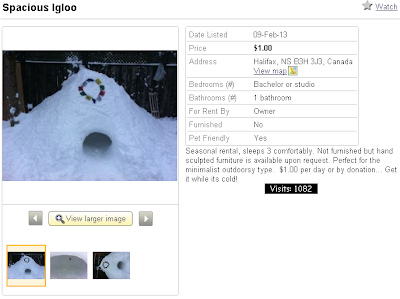 Here's an igloo. Seasonal rental, sleeps 3 comfortably. Not furnished but hand sculpted furniture is available upon request. Perfect for the minimalist outdoorsy type. $1.00 per day or by donation... Get it while its cold!